Here they are! The last pairs of Christmas socks. I did also give away a felted purse, but I knit it months ago and forgot to take a picture. Here are Melly's pirate socks! 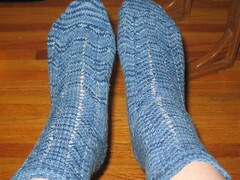 They're knit in Lorna's Laces Black Purl (hence the name), and they're just twisted rib all the way down. They're ankle socks, because I knew Mel didn't like long socks. 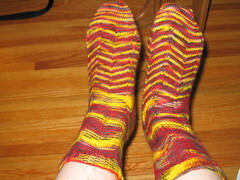 They're knit in cmtigger's Mickey Mouse yarn, which I couldn't resist once I saw it. (Mickey's pants are red, his bow tie is yellow, and he's black, hence the colours.) It took me a couple of starts to get it to fit, and the final version's legs are kind of pooly, but the feet striped REALLY well! And here are Karen's Broadripples. 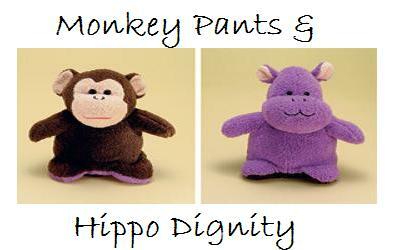 My favourite thing about these is the ripply top. 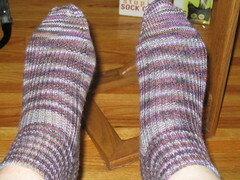 These are knit in the suggested yarn (which NEVER happens! ), Cascade Fixation. I think the colourway is Denim. Written at 6:51 p.m. by SarahJanet.